I finally did it. I’ve been wanting to bake with some alternative flours for some time and this weekend I finally made Pumpkin Muffins using whole spelt flour! And they are deeeelicious. We’ve definitely been missing out. The texture is much more cake-like and the flavor is milder than whole-wheat flour. And it was super easy to make the 1:1 substitution…I have no idea why I kept putting it off! I must thank our sponsor, Nature’s Legacy, for giving me the final push (i.e. a bag of spelt in the mail!) that I needed to dive right in and give it a shot. Spelt may sound like a “new” grain, but it’s actually been around for more than 9,000 years. As I mentioned the flavor is “lighter” than wheat and even though it contains gluten, some with an intolerance to wheat find that they are able to enjoy spelt. Just like wheat though, you want to be sure to select “Whole Spelt” products as opposed to the refined (white) version. And to keep your whole spelt flour fresh, it’s best to stick it in the freezer (or fridge) along with your other whole grain flours. In addition to flour there are also other spelt products available, like pasta. To learn more about the benefits of eating whole spelt and how it differs from wheat check out this FAQ page. 10/30/13 update: I was in LA recently and got to visit Catherine McCord (of Weelicious) in her kitchen where I showed her how to make these muffins. Check it out in the video below! Preheat the oven to 350 degrees F. Line a muffin pan with liners and set aside. Make a well (hole) in the center of the flour mixture and drop in the eggs, honey, and melted butter. Mix together until well combined. Fold in the pumpkin puree. Do not overmix. Pour the batter into the muffin pan so it’s evenly distributed. Bake until golden brown and a toothpick comes clean, about 18 – 20 minutes. Store at room temperature or freeze for a rainy day. We recommend using organic ingredients when feasible. Hi…I’ve been looking thru the comments to see if a suggested cooking time has been discussed for making these as mini muffins. Not seeing a comment about this. What do you suggest? Hi Susanna. I usually start checking mine at around 12 minutes. can apple sauce be subbed for the butter? if so is it 1:1 ratio? Made these muffins tonight with 2/3 whole wheat flour, 1/3 regular flour, and 1/3 honey, 2/3 maple syrup (ran out of honey). I doubled the batch. They’re great! They’re exactly what I was looking for in a muffin for my toddlers. I wanted something that was not a dessert but rather something I could give them for breakfast or as a healthy snack. Perfect! Yes it was a 1:1! They are great! I made these muffins tonight and added raisins, which got me 2 more muffins. Yay! They’re SO good!! P.S. I used whole wheat flour because i didn’t have spelt flour, and they turned out great. I made these tonight and my family loved them! These will be made again and again. Hi Lisa, I made these whole spelt pumpkin muffins last night and they were INCREDIBLE! I’m diabetic, so I subbed the pumpkin and honey. Instead, I used sweet potato puree and agave. I was amazed by how easy they are to make, but how incredibly delicious they turned out. The secret is the pumpkin pie spice; I made my own spice following the link you posted on the ingredient’s list. I suggest everyone to never leave this ingredient out, it makes the whole difference. Thank you for the recipe Lisa!! Hi, why are the recipes not showing up? All I’m getting are these “recipe id” things. Hi there. There must have been a hiccup in the system. Hi, I’m just wondering if I can use whole wheat white flour in this recipe instead of spelt? Do you have other favorite uses for spelt flour? We finally found it (and love these muffins), but I’m wondering what other recipes might benefit from use of this type of flour? Hello Nora. You can use it pretty much anywhere you would use whole wheat. Fantastic muffins! Absolutely delicious :) can’t believe they are healthy. Thanks for this great recipe! The family has enjoyed everything I have made from 100 Days of Real Food :D Great to know that there are recipes that are both healthy and delicious. This has become a family-favorite, but because of a life-threatening milk allergy in one of our children, I’ve made a few substitutions. I wanted to share them with you in case other readers might need to do the same. First, the recipe doubles perfectly (clearly we love them – I can’t make a single batch!). I sub equal parts melted coconut oil for the butter – and also used 1/2 almond flour in place of the whole wheat flour. They come out perfectly ever time! Kristen, thank you for sharing your non-dairy substitution for those of us who are in the same boat! I made these the other night but used the whole can of pumpkin since I knew it would go to waste otherwise. They turned out great and even my 12 yr old loved them. This is the first time I have used spelt and will definitely be using it again! What happened to the whole spelt lemon cottage cheese pancake recipe? :( it’s gone. I have cottage cheese I intended to use up with this recipe. Is it posted elsewhere? Thanks! It’s probably your spices – I find that ground nutmeg can be gritty sometimes. I have made these muffins dozens of times & decided to try almond flour. I followed the instructions (per the manufacturer) to use half the amount of almond flour & the muffins came out totally deflated. Any ideas as to why?!? Hi Maureen. No sorry. We’ve not tried to make these with almond flour. Can I substitue sweet potatoes instead of pumpkin? Would I do a different kind of spice, or keep it the same? Hi Brooke. You can use sweet potato puree without changing the spices. Can you sub the 2 eggs with egg replacement? Hi there. You can or some readers use “flax eggs”. I would like to make many of the muffins on this site but they mostly have honey in them. I am making them for my 9 month old and I have been told no honey before 12 months. What can I substitute? I have maple syrup? Babies should not eat raw honey, once you bake it, it is fine. 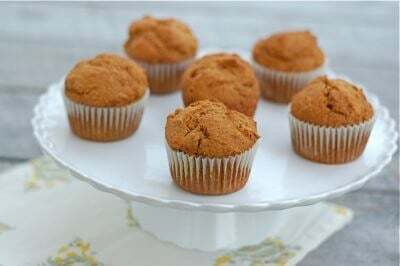 I love pumpkin muffins and this is a much healthier recipe than what I usually make. Can’t wait to try them! Can you explain the process of freezing and thawing the muffins? Hi there. After the cooked muffins have completely cooled, put them in an airtight container or bag to freeze. When you are ready to defrost, just place them in the fridge overnight. Could I substitute mashed banana for the pumpkin (and leave out the pumpkin spice)? Trying to come up with a different variety for my boys. I’ve never baked with spelt before and loved the texture! Thanks! Hi Caroline. Yep. I’ve used this as a banana-nut muffin recipe. It is yummy. These were delicious! They had a great texture and flavor – not too much pumpkin or spice. This is my new favorite, easily doubled, all in one bowl and freeze great! Husband loves them. I used fresh roasted pie pumpkins…so good. Five stars for sure. Im out of honey what can I substitute? Hi Anita. You could try maple syrup. We added blueberries to these and they were amazing! I followed the recipe exactly and they are wonderful!! My kids and my husband loved them! Thank you for such a wonderful recipe! In your recipes when you say melted butter, do you mean salted or unsalted? Hi Trudy. Either. I typically use salted. Thanks! Question… Do you have nutritional info on these (specifically how much protein and sugar in each one)? Thanks! Love these so much!! Question… Do you have nutritional info on these (specifically how much protein and sugar in each one)? Hi Holly. We do not provide nutritional info on recipes. This helps explain why: http://www.kingarthurflour.com/recipes/whole-wheat-sourdough-bread-recipe. OK, no problem. Though I don’t think that was the link you meant to share. You are right. : ) Here is the correct one: https://www.100daysofrealfood.com/2013/01/04/healthy-eating-defined/. Are there any baking powers without cornstarch or aluminum? I was surprised to find these ingredients in the one I’ve been using for a long time. The Whole Foods 365 brand does have corn starch but is aluminium free. I just read that says you can make your own baking powder by mixing one part baking soda with 2 parts Cream of Tartar. I haven’t tried it but it might be worth a try. Hi. Rumford has non-gmo corn starch and no aluminum. This may help: http://wholenewmom.com/health-concerns/make-your-own-baking-powder/. Can I make this in a 8 x 8 cake pan? How would I adjust the baking time/temperature? Hello. This thread might help: http://community.kingarthurflour.com/content/quick-bread-muffin-recipe-conversion. I have made 2 different variations of these muffins for my kids school lunches and they love them! For my son who likes blueberry muffins I substitute applesauce for the pumpkin and add blueberries, cinnamon and nutmeg. (No pumpkin pie spice) For my son who likes banana muffins, I substitute mashed bananas for the pumpkin and leave out the spices. I really like adding walnuts to them also. So good!! Hi, Could I get the nutritional values for these muffins? Calories, sat fat, protein, fiber, sugar etc? Thanks! Hello Ann. We do not provide those details. This helps explain why: https://www.100daysofrealfood.com/2013/01/04/healthy-eating-defined/. Made these at the weekend and my kids loved them! We can’t get hold of pumpkin purée easily here in England, so I used sweet potato purée instead. Delicious and so moist! The sponge reminds of of Jamaican ginger cake, so I am going to flavour these with more ginger next time. Thankyou for the recipe! I’ve used a similar recipe for ages. I use 1 tbsp canola and 2 tbsp applesauce for the fat, a 1/4 cup more honey + 1 cup shredded carrot. You barely notice the carrot, but adds more vitamins and fiber! Yum! Oops I forgot! I added rasins too. Is there anywhere I can find the nutritional info? I was kindof looking for the same thing..
Hi. We do not provide nutrition information. This post will help you understand why: https://www.100daysofrealfood.com/2013/01/04/healthy-eating-defined/. Hello. I often sub with an all purpose gluten free whole grain blend. Made these muffins but substituted same amount of garbanzo bean flour. They came out perfect! Thank you! Yummy! Do you think, or have any of you, used almond flour? We have not subbed with almond flour. This might help, though: http://alldayidreamaboutfood.com/2013/02/low-carb-basics-baking-with-almond-flour.html. What I can I use in place of honey? Hi. You could sub with maple syrup. We really don’t use stevia in our baking so I can’t guide you as to an amount. Can you use stevia in place of the honey and if so how much. I read that real honey is not actually sold in stores and if you want pure honey you should get it from a bee farm. It does not look as pretty as the honey sold in stores. Any advice is much appreciated. Hi. We really don’t use stevia in our baking. As for honey, if you buy raw honey, you are buying quality honey with all its enzymes in tact. You can find it at stores like Whole Foods but most larger mainstream grocery stores have it, too. Even better, look for local raw honey at your farmer’s market. I love these muffins! I modified this recipe to use 1/3 c egg white instead of whole eggs and 1/3 cup organic, unsweetened applesauce instead of butter. I also used 1/2 c pure maple syrup instead of honey which brings the grams of sugar down. They are still delicious. Moist and cake-like and the maple and apple add a complexity to the flavor. Brings them from 7 weight watchers points down to 3. These are delicious and super easy to make. I made these just as written. Loved them, the whole family did! Thank-you! My super picky preschooler ate 3 of them. Literally licked his plate. I subbed applesauce for butter, maple syrup for honey. They were moist and cake like and easy to make. Not very sweet, which I didn’t mind, but thought my son wouldn’t like them because of that. I was wrong! Yay! I think it was the texture that sold him on them. Now he’s asking for green muffins, so I’m going to try spinach/banana muffins. I love these muffins? Does anyone know how many calories are in them? How should I best freeze these so that they last during the school week? Thanks! Hello. I freeze in ziplock bags, removing as much air as possible. I just made these… AMAZING! Mornings are hectic here, but these will be a great way to start the day! Thank you! I’m wondering if I can use agave instead of honey? Nothing against honey, i just have agave and am trying to get rid of it. Hello. We don’t use agave in our recipes so I can’t advise on its use. We only use honey, maple syrup, and occasionally a bit of sugar. I love these muffins! Has anyone calculated the Weight Watchers Point value per muffin? You may want to try these using buckwheat flour. I use it for pancakes and breads so this is going to be my next recipe to try. I would love to see more recipes using spelt flour. Nature’s Legacy used to be called Vita Spelt and it’s what I’ve cooked with for a number of years when we discovered that my son is allergic to wheat (not gluten intolerance – actual wheat allergy). I usually used their whole grain white as I could make things for him that he would eat more readily than the whole grain spelt. I would love to cook with spelt all the time – it tastes so much better! Can’t wait to try this recipe!! How can I determine the nutritional value for these wonderful muffins? Can you also recommend a good whole grain bread to try? There are online tools that can help you figure out those details such as My Fitness Pak and many others. Food for life’s Ezekial bread is a good choice. Very yummy recipe!!! I was looking to cook some pumpkin muffins today, and this recipe has just the right amount of sweetness I was looking for! I don’t eat clean sometimes but I try to when I can! Thanks so much! I made these muffins the other day, and they turned out amazing! I only had 1/4 cup of honey at the time, so I used a little under a 1/4 cup of maple syrup and a squirt of stevia to compensate for the rest. Everyone loved them. Gonna try a pumpkin banana variation today (not enough pumpkin) and see how they turn out. My kids love this muffins. I added dark chocolate chips to them and they turned out great. I’m really new to eating whole foods and I’m quite clueless about all of it. Can you tell me which dark chocolate is best to use? Is it considered a whole food? Hi there. Look for an organic dark chocolate with a low ingredient list. The pumpkin pie spice used to take you to a homemade recipe. Now the link takes you to an amazon premade spice. Can you post the original pumpkin pie spice recipe? I love the muffins but we always made it with your original spice. Hi. You can find the ingredients for the homemade spice in this recipe: https://www.100daysofrealfood.com/recipe-pumpkin-bread/. What is a good bread kids will eat and tortilla wraps? Trying to eat healthier? Hi there. Here are Lisa’s recipes for both: https://www.100daysofrealfood.com/recipe-honey-whole-wheat-sandwich-bread-for-bread-machine/ and https://www.100daysofrealfood.com/recipe-whole-wheat-tortillas/. I always make these muffins as a double batch for freezing. I was low on canned pumpkin today and completely out of pumpkin spice. I altered the double-batch recipe with no added sugar applesauce and substituted cinnamon. I think they turned out even better than the original (gasp!) – a touch sweeter and a hint of apple. Mix and bake according to original recipe. Enjoy! These are a family favorite! So good and so easy to make! Has anyone ever tried a substitute for the eggs in this recipe? If so, what have you used & how did they turn out?